Recently, Southern California has experienced much-needed rainfall. Unfortunately, rain falling on developed watersheds turns into runoff and brings highly polluted stormwater and debris to the beach. Last Tuesday morning, Surfrider chapter volunteers and local beachgoers in Southern California were horrified to find mounds of trash and debris at the beach. The scene at Seal Beach, which receives massive amounts of runoff and trash from the adjacent San Gabriel River, was particularly devastating. Everything from dirty syringes and medical waste to plastic food containers and furniture lay sprawled across the beach. Check out the short videos linked here which document the devastation of Seal Beach, including an interview of the Huntington Beach/Seal Beach Chapter Advisory Committee member Tony Soriano. As disheartening as it is to see your favorite beach covered in trash, it’s what you don’t see that can be even more dangerous. Stormwater brings bacteria and other pathogens to the beach where it can cause people to get sick. Skin infections and rashes; eye, ear and nose infections; and gastro-intestinal symptoms are some of the more common yet minor - but still certainly not fun- afflictions that can be picked up by surfing or swimming in the ocean after it rains. And there’s worse with MRSA, vibrio and other life threatening diseases that are possible to contract if exposed to human sewage in recreational waters. Learn more about these dangers here. This is why health authorities like the Los Angeles Department of Public Health recommend that people avoid swimming at the beach for 72 hours after it rains. This is also why Surfrider volunteers around the country are out testing the waters and measuring bacteria levels through the Blue Water Task Force (BWTF) program - so you and your family know where it’s safe to swim. Pam Conti, the BWTF coordinator for the Surfrider Foundation Huntington/Seal Beach Chapter spoke to a reporter at the OC Register and explained the high bacteria counts that she and her students at Pegasus School measured this past week. “It’s typical to have these numbers during large storm events. All the pollution and animal feces, or possibly human, is coming down stream from cities,” Conti said. In fact, bacteria counts of 4,374 enterococcus/100 ml seawater were recorded in water samples collected from Seal Beach on February 1, 2019 during a recent storm event. This is over 40x higher than the state health standard of 104 set to protect public health in recreational waters. See where the Huntington/Seal Beach Chapter is testing and view their recent results here. Unfortunately, the high bacteria counts were not limited to Seal Beach alone. Surfrider chapters have been recording high bacteria levels at ocean beaches from San Diego County up through Marin County during storm events over this wet winter season. Stay safe and avoid swimming and surfing in polluted runoff after it rains, and check local water quality results before you go to the beach, especially as the rain in California continues. See where Surfrider is testing and view all our data on the Blue Water Task Force website. 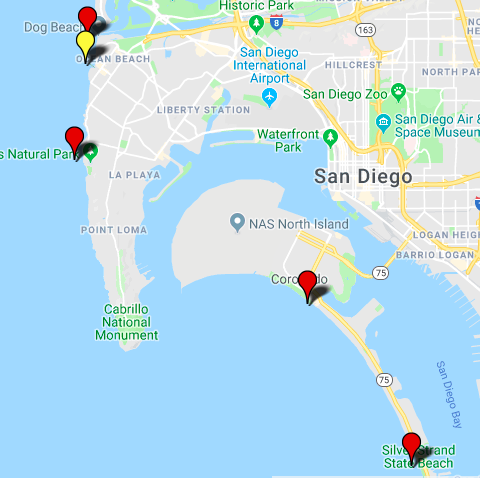 Water samples collected at Ocean Beach and Coronado in San Diego on February 14, 2019 show elevated bacteria levels and potential health risks at the beach after more rain in Southern California. Want to help protect your local beach? Join the Surfrider Foundation and get involved with your local Surfrider Chapter!